We received the mentioned product in exchange for an honest review. The thoughts contained in this post are ours and may vary from the thoughts of others. At 1000Bulbs.com, the vast inventory of products includes commercial and residential lighting of the highest quality. Whether the situation calls for Christmas lights during the holidays, LED bulbs in your bedside lamp, or even the street lights that line your neighborhood, their products and brands are all hand-picked. From the White House to your house, 1000Bulbs.com is committed to providing simple and efficient lighting solutions to everyone. Line your pathway, driveway, or lawn this holiday season with candy cane path markers! Each of these 8 classic red and white striped candy canes are 24 inches high and come with a stake for easy ground mounting. The candy canes are pre-lit with 80 incandescent bulbs and connect over 26.5 feet of white wire. The string has a 5-foot lead, making it convenient to reach an outlet and comes with an 8-function controller to create combination, in wave, sequential, slo-glo, in wave/twinkle flashing, slow fade, twinkle flashing, and steady on lighting patterns. Bring the magic of the holidays to your home with these charming Christmas decorations. Right around Thanksgiving every year my family starts to decorate for Christmas little by little. We don’t go full out Christmas mode until after Thanksgiving but we do try to get our tree up and a few outdoor lights prior to feasting because I always have a hard time doing ANYTHING productive following a giant Thanksgiving meal but I do love getting into the holiday spirit! 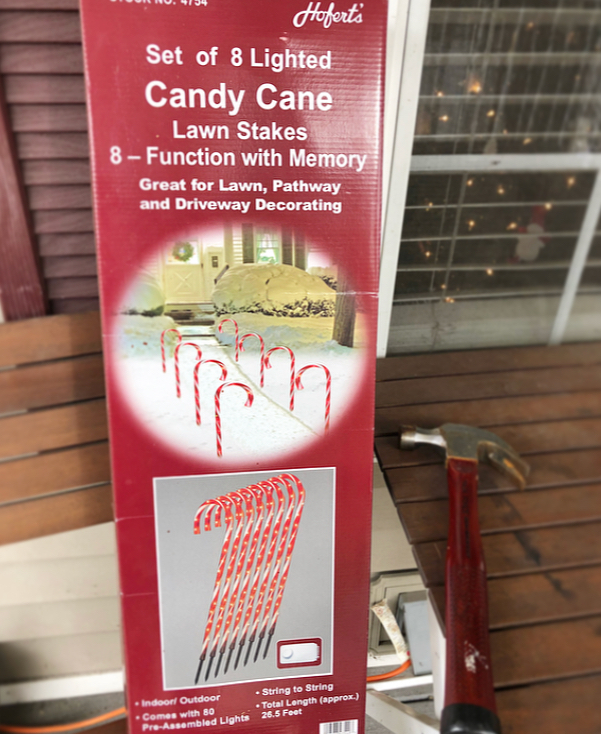 The 8 Candy Cane pathway markers are a fun way to add color to your outdoor Christmas display! Each year I look forward to adding decorations to our outdoor Christmas set up. As our children age, they have begun to enjoy helping pick what decorations we add. When we received the candy cane lights we couldn’t wait to get them put up and plugged in! I’ll admit, my husband is usually the one to do the outdoor decoration. I’ve never been too good at spacing lights or figuring out what plugs need to go where to avoid 100 extension cords snaking all around our property creating dangerous trip hazards. The day I received the set of lights was the day my husband started his 4 day rotation at work. I was determined to put the candy cane markers up myself! After all, how difficult could it be? The most difficult and time consuming part about this light display was the untangling of the cord. It came out of the box pretty wrapped around itself so straightening the set of 8 candy canes out was a bit of a pain. That’s ok! I was determined I would get them up before my husband got home and before I had to pick my kids up from school! I wanted to surprise everyone. The stakes that are included in the box went right into the ground with a little help from a hammer. Our ground was pretty solid because of the freezing weather we’d been experiencing over the past week. The distance between the candy canes did not allow for me to put them on either side of our walkway as our walkway is a bit wider than most so I decided to stake all 8 of them up around the roadside perimeter of our front flower bed. They still looked fabulous! Upon arriving home from school, all of my kids bailed out of the car and squealed with delight over our new row of candy canes! The next morning several of our neighbors commented on the display as well! They remarked that the new candy cane lights were a great addition to our front lights. Perhaps one of the most fun parts of these lights is you can program the candy canes to light up 7 different ways with the simple turn of a dial! If you’re looking to spruce up your light display I recommend going to 1000bulbs.com and browsing their selection of top quality Christmas display items. Right now you can save 15% on select items by using the code BF2018.